Petra Ecclestone’s LA home for sale for $150 million! Petra Ecclestone has put her LA mansion up for sale. Petra bought her home in 2011 for $85 million. 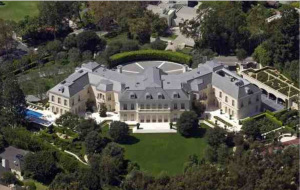 The huge mansion was previously owned by producer Aaron Spelling. Petra purchased the mansion when she was just 22 years old, she then spent a further $25 million on updating her new home. The house has parking for one hundred cars, just in case you want a few friends round. It has been refurbished throughout and includes a fully functioning beauty salon, 14 bedrooms and a dressing room the size of an average home. The whole property is 56,500 square feet and is thought to be one of the most expensive homes in LA, if not the United States. If Petra gets her asking price she could set a new record for the most expensive home in LA. Money is no object to the Ecclestone family with Petra’s father worth an estimated $4 billion. Petra stands to make $40 million in profit if she can get her asking price, although their are not many people who could afford to buy this house. It will be interesting to see how long this mansion takes to sell, and just who will be the buyer. Also just why is she selling, is she going back to London? Petra is very close to her sister Tamara who lives in London. Although the sisters do see a lot of each other, as they jump on private jets like other people hop on buses. This entry was posted in Petra Ecclestone and tagged Bernie Ecclestone's daughters., LA, LA mansion, LA's most expensive mansion, Petra Ecclestone, Tamara Ecclestone on August 1, 2014 by wealthandglamour.